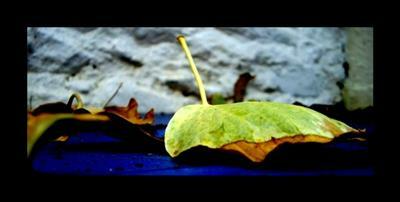 I sat the camera on the bench in front of the leaf and really liked the outcome. Steph submitted a selection of flower shots, all with the same look and feel as this one here. Rather than comment on them all individually, I thought I'd comment on this one (as I feel it's the best of the bunch) and offer a suggestion for the others. So here goes . . . The things that strike me about this photo are the colours, the simplicity of the composition and the border. The colours first – I like the saturation of this photo – deep blues, saturated greens, and a cool white wall behind them. I love it! It looks like there has been some adjustments made using software – contrast and saturation mostly. And I think it works really well here. The levels have been boosted to a point where the photo almost looks cross processed. 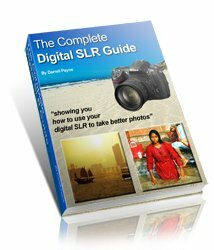 Click to read more about the cross processing effect). And so to the composition – this is one of those photos where a few things may have needed moving a little to get the composition just right. Nothing wrong with that. In Steph's photo above I particularly like the isolated leaf, sitting upright on the shelf. I also like the other leaves in the background. If they were not here the main leaf in the photo would have looked too isolated. And finally to the border. For my liking it's too much. Very thick and heavy. I think a border works well for this type of photo, but I feel a more subtle border would have been better. So, my suggestion . . . as I said at the start of this critique this flower photo was one of a few that Steph submitted. They share common elements – close ups of flora, saturated tones, and heavy borders. This makes them ideal candidates for a set of images, rather than singular. I think placing them together would strengthen them – I had a go myself, and the results of my flower montage are here. I can see these photos sold in shops as lifestyle pictures, in sets; or maybe pre-arranged on a poster?